Cool! 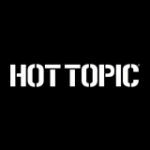 Save an average of 20% on Hot Topic Promo Codes with 6 Coupon Codes, and 36 Deals! Hot Topic is retail chain focusing on music and pop culture related accessories. Its main products include apparel, accessories, swimwear, shoes and music. Over half of its revenue comes from the sale of its accessories and items from some of the world's best brands such as Levi's, Converse and Atticus and customers love the latest designs. Details: For a limited time, save 25% off your purchase. Plus, Get $5 Off Orders Over $50 with code. Ends 3/26/14. Details: Save 25% off your purchase plus an additional $5 off your purchase of $50 or more. 25% discount valid on regular price merchandise only. Ends 2/22/14. Details: Shop sale items for $10 and under. Details: Get Up to 40% Off Select Outerwear. Details: Shop sale styles for $20 and under. Details: Killer Gifts: 30% Off Select Accessories from HotTopic.com! Limited Time Only - Shop now! Details: Get $15 Hot Cash coupon For Every $30+ You Spend. Details: Get $7.48 and Up Select Jeans. Details: Get $1 Shipping Over $30. Expires on 02/21/2014. Details: Get 40% Off Select Cold Weather Apparel. Details: Get 30% Off Sitewide. Includes Clearance. Plus, save $5 off your purchase of $50 or more with code. Expires on 02/24/2014. Details: Take 25% Off Any Order. Expires on 02/23/2014. Details & Exclusions: Take 20% Off Entire Site, Including Clearance. Limited Time Only Exclusions: Offer not available on CDs, DVDs, vinyl, Pleaser shoes, prior purchases, gift cards, shipping or taxes. Hot Topic, Inc. employees and their families are not eligible. Hot Topic, Inc. reserves the right to end or modify this promo at any time. Details: Check Out The Latest Deals. Click here to see the most recent promotions. Details: Shop baby tees and clothes now available at Hot Topic. Details: Limited Time Only. Shop All Shorts $9.99. Details: Save $10 on Select Hoodies. Limited Time Offer. Click to activate. No code required. Details: Shoes & Boots Up To 50% Off. Online Only. Select Styles. Details: Shop Select Backpacks for up to 50% Off. Restrictions May Apply, See Merchant for Details. Details: Receive $4.99 Flat-Rate Shipping on Any Order. No coupon code required. Details: Save Up to 75% on Clearance Items. Prices starting at just 1.95 cents. Click to activate. No code required. Details: Buy 2 clearance items, get 1 free. Not valid on regular priced merchandise, prior purchases, gift cards, shipping or taxes. Details & Exclusions: 25% off entire site. Regular price only. Exclusions apply. See merchant's site for details. Exclusions: ffer not available on clearance merchandise, CD's, DVD's, vinyl, Pleaser shoes, prior purchases, gift cards, shipping or taxes. Offer not combinable with BOGO $5 Pop Culture Tees or Jeans & Chinos promotions. Details: Buy Two or more jeans for $25. Select styles. Offer not available on clearance merchandise, prior purchases, gift cards, shipping or taxes. Details: Get $1 Shipping Over $30. Expires on 02/27/2014. Exclusive Kids Music Tees - Youre Never Too Young to Rock! Details: Get Exclusive Kids Music Tees - Youre Never Too Young to Rock! Details: Receive $15 in Hot Cash for every $30 spent. Expires on 04/30/2014.